Description: Square black flat panel (measures 2" long, 2" wide). 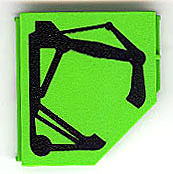 Description: Flat black square panel with one corner cut off at an angle (measures 2" long, 2" wide). Description: Square blue flat panel (measures 2" long, 2" wide). Description: Square dark blue flat panel (measures 2" long, 2" wide). 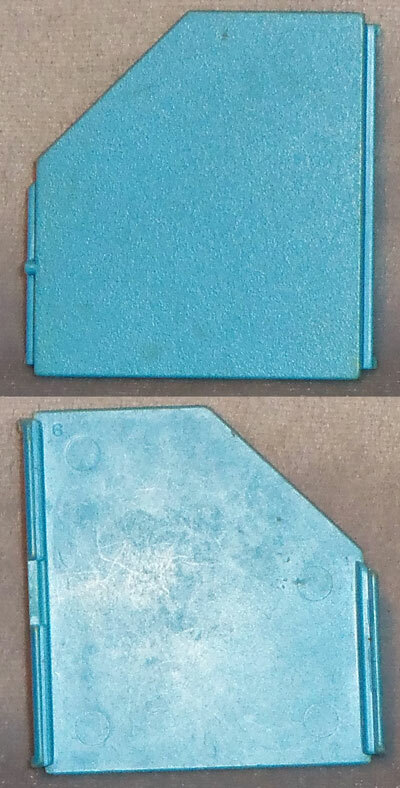 Description: Flat blue square panel with one corner cut off at an angle (measures 2" long, 2" wide). Description: Flat dark blue square panel with one corner cut off at an angle (measures 2" long, 2" wide). Description: Large square clear plastic blue-tinted flat panel with 9 equally spaces "lines" (measures 4-1/4" long, 4-1/4" wide). Description: Square clear plastic green-tinted flat panel with 4 equally spaces "lines" (measures 2" long, 2" wide). Description: Large square clear plastic green-tinted flat panel with 9 equally spaces "lines" (measures 4-1/4" long, 4-1/4" wide). Description: Square green panel with one corner cut off at an angle. The panel has a dark green spotted pattern (measures 2" long, 2" wide). Description: Square green panel with one corner cut off at an angle. The panel has a black odd-shaped line pattern (measures 2" long, 2" wide). Description: Square silver flat panel with a squared grid pattern that may be indented (measures 2" long, 2" wide). Description: Silver square panel with a corner cut off. The panel has a grid pattern with 3 triangles that may be indented (measures 2" long, 2" wide). Description: Square tan flat panel with military green camouflauge designs on one side (measures 2" long, 2" wide). 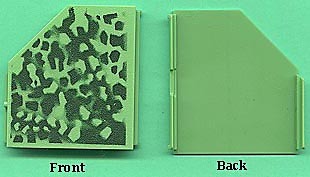 Description: Square tan panel with one corner cut off at an angle with military green camouflauge designs on one side (measures 2" long, 2" wide). Description: Tan square panel with a corner cut off (measures 2" long, 2" wide). Description: White square panel with a corner cut off (measures 2" long, 2" wide).